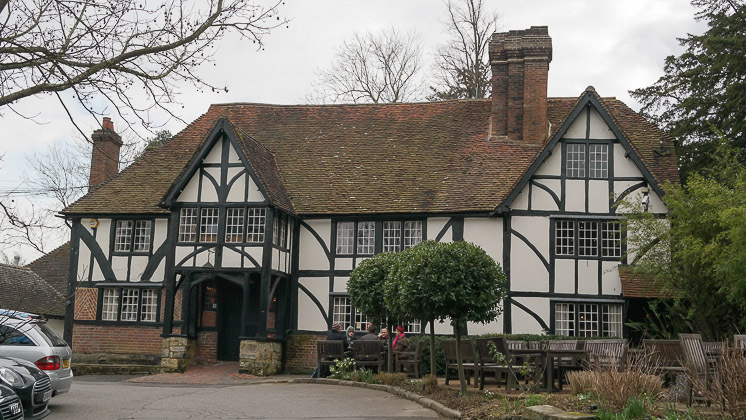 I was recommended The George and Dragon in Speldhurst from someone on Twitter, and didn’t realise until later that it is the sister venue of The Black Pig in Tunbridge Wells (scored a Top Rated). I booked for the 3 of us (Claire, our toddler JW and me) on Mother’s Day, and looked forward to seeing how it compared! It was an old building, upon entering there were some stairs going up, a restaurant door on the left (which was also where we would find the toilet being situated) and a door on the right into the bar area. We were shown to our table next to large open (log) fire and a window. There were lots of nick knacks dotted around. The table had pretty flowers and a large candle – it was laid out with linen napkins. The venue had a really nice hubbub. A glass of processco for Claire and a hot ginger beer (in spice, rather than temperature – and non-alcoholic) for me. 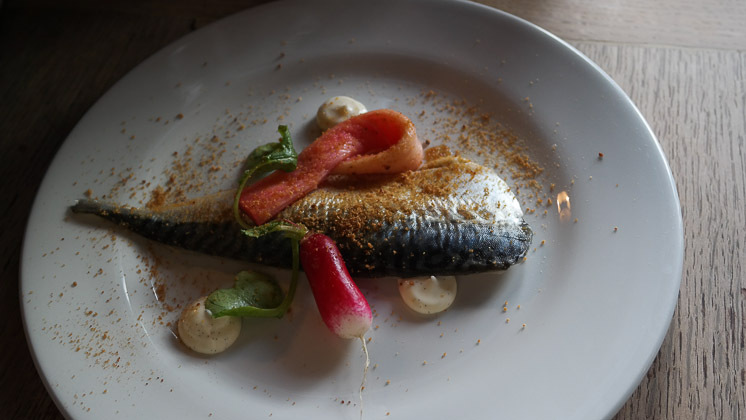 Claire ordered the mackerel with rhubarb for starter, we ordered JW (our gluten, wheat and dairy free toddler) some hummus. I asked for the pork knuckle terrine. Starters were served quite quickly – Claire didn’t expect a whole fillet! The young, forced rhubarb was beautiful. 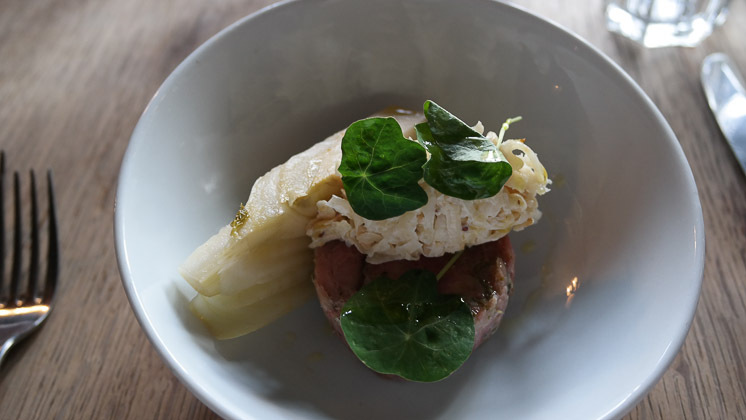 My pork terrine was great but I did expect some bread with it – there was celeriac and coleslaw on top (which I don’t eat – so left). 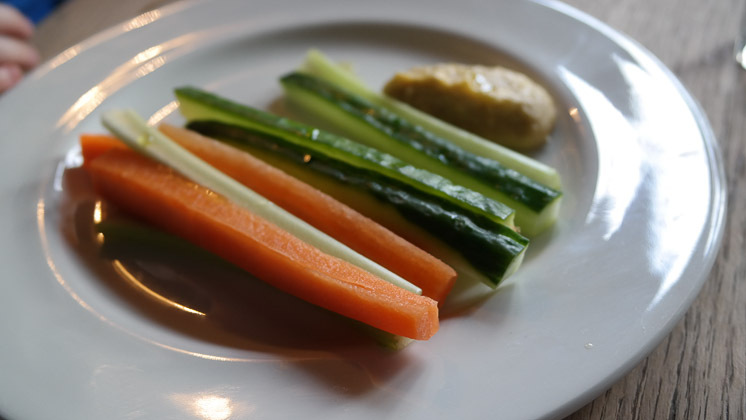 JW loved his hummus, even eating some cucumber :-). The main course was served shortly after we finished our starters. I had 2 thin but long slices of beef, 3 roast potatoes, a Yorkshire pudding, parsnip, pureed swede, cabbage and thin gravy. Claire mirrored mine, but with pork belly with thick crackling rather than beef and Yorkshire pudding. Tucking in, the beef was very delicate, being rare, and delicious. The potatoes were crispy with nice seasoning – and lovely gravy! 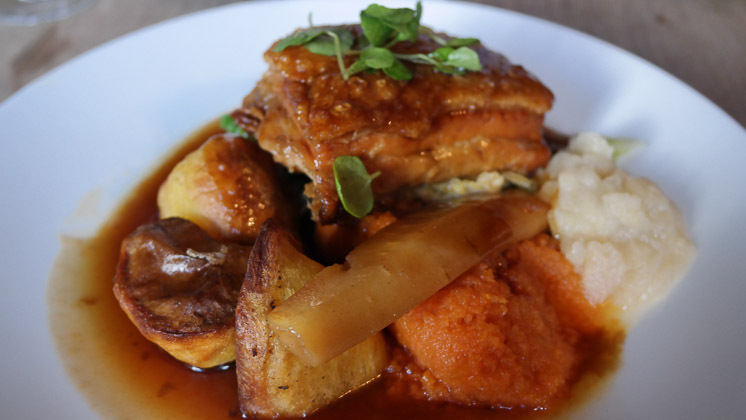 I tried Claire’s pork belly – wonderful! I decided to try something a bit different and chose the Orange Cheesecake with kumquats and space dust! 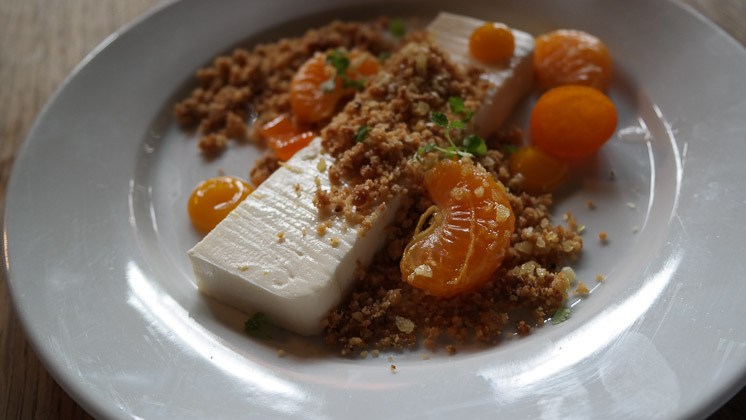 The cheesecake arrived “deconstructed”; kumquats were very tangy and sharp, matching the orange cheesecake – the space dust actually added to the dish. 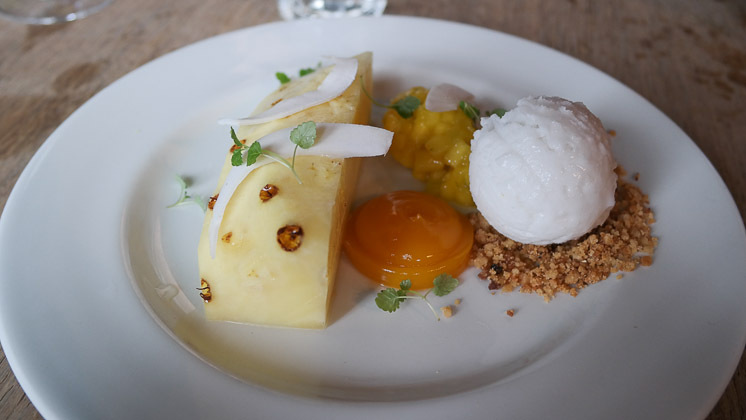 Claire ordered the Compressed Pineapple with syrup and coconut sorbet – it was nice, fresh and tropical. 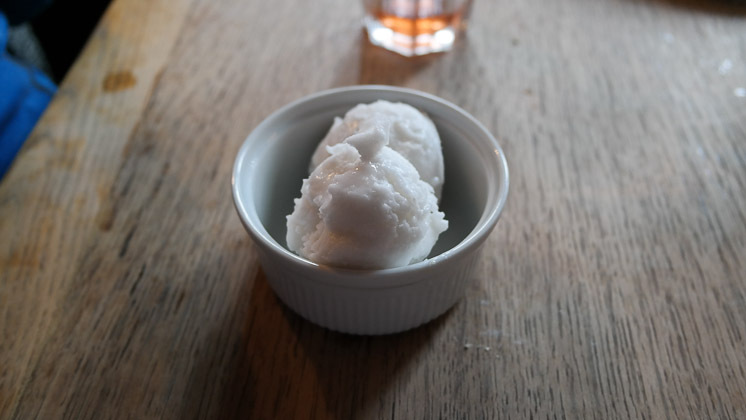 JW finished his meal with a coconut sorbet. We didn’t need to use it, but there were decent baby changing facilities. We had a highchair for JW which was in good repair and clean. He was very happy with his Sunday lunch, and the serving size was good. We weren’t given anything to entertain JW, but we had stuff anyway. Overall, good for families. 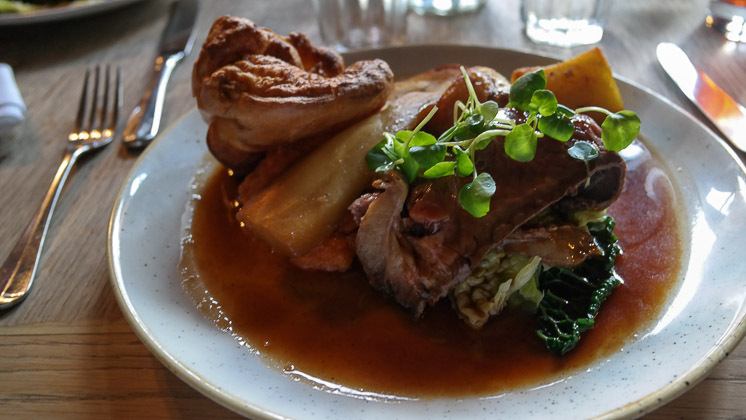 An amazing Sunday lunch experience at The George & Dragon in Speldhurst. The venue was large with a good atmosphere, the staff were friendly and attentive. A good selection of non-alcoholic drinks meant I could have something a bit more interesting rather than the usual blackcurrant and soda. Our food was delicious – a great Sunday lunch with excellent roast potatoes and beef. I also enjoyed my dessert – make sure you order it if you visit. 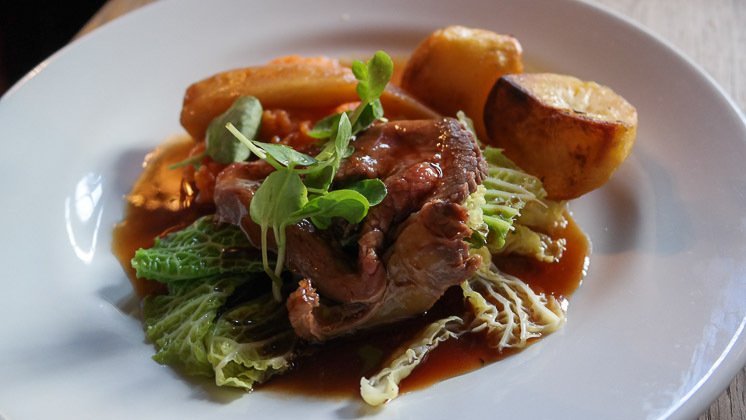 Overall, a Top Rated Sunday lunch for The George & Dragon in Speldhurst, Royal Tunbridge Wells – suitable for family get-togethers, celebrations and romantic meals for 2. Oh, and dog friendly as well.